Luxury vehicles owned by the Lao government sit inside the National Convention Center in Vientiane where they will be auctioned to the public, Feb. 28, 2017. Photo Credit: RFA. The Lao government has auctioned 14 luxury cars previously used by the country’s leaders in its latest effort to cut costs and rein in corruption in the impoverished nation by getting rid of pricey autos that high-ranking officials had been using for free for official and personal business. The event took place on Feb 28 at the National Convention Center in Vientiane, where about 40 people showed up to examine and bid on the used luxury vehicles of retired and current Lao government officials. 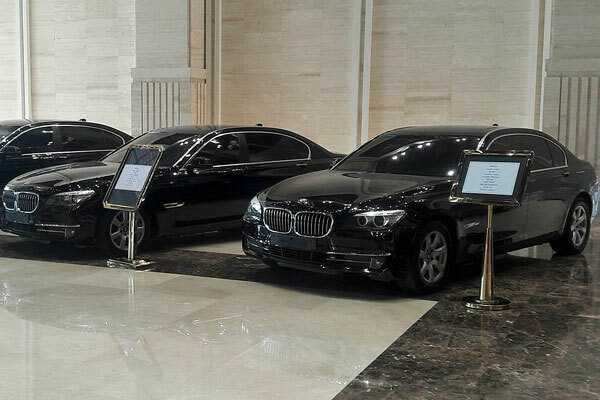 Seven full-size 2012 BMW 730 LI model sedans and seven full-size 2012 Mercedes Benz S350 model sedans were sold, said a man named Somsy, who was in charge of the auction. The opening price for bids was set at $100,000 for the BMWs and $60,000 for Mercedes Benzes, according to a report by the Vientiane Times on Feb. 24. The event was originally scheduled for Feb 22, but two days before the opening, the committee that organized the auction decided to move the date to Feb. 28 because it did not have all the necessary paperwork ready and had become aware that many people still did not know about the event, Somsy said. The used luxury car of current Prime Minister Thongloun Sisoulith was the highest-priced vehicle. It was sold for 1.33 billion kip (U.S. $160,000) to Thonglith Kingkeo-oudom, a Lao businessman from Luang Prabang province. Fouk Kingkeo-oudom, Thonglith’s brother who is also a businessman from Luang Prabang province, paid the second-highest auction price of 1.30 billion kip (U.S. $156,000) for the used luxury car of the incumbent Vice President Phankham Viphavanh. Both cars were 2012 BMW 730 LI models. Thongloun Sisoulith told members of the National Assembly last October that his administration had issued some legal orders and decrees to cope with the country’s budget deficit and to address corruption among government officials. He also told the media in January that he feared the growing gap between the rich and poor in the impoverished country would eventually cause problems. “We have been experiencing financial difficulties, and the majority of our people are poor,” he said. “If we live lives of luxury, then the gap between rich and poor will grow too large, and that is going to be a big problem,” he said. High-ranking officials must act as an example and follow the orders of the government to reduce the inequities, he said. 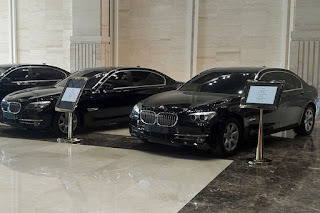 The auction of luxury cars used by Lao leaders is one of several early policies enacted by the prime minister to reduce unnecessary government expense and combat corruption among government officials. Somsy said another batch of vehicles will be auctioned in the near future. “We have not made any plans yet to auction the second batch of luxury cars, but we will try to do it as soon as we can, perhaps in March,” he said. The second batch will include Mercedes Benz E-class cars recalled from officials in the provinces where they are used to transport provincial government guests, Somsy said. The Lao government is replacing the luxury cars with less expensive Toyota brand cars that have lower maintenance costs. Lao leaders who are politburo members will be issued Toyota Camry model 3.0 or 3.5 cars, while other government leaders who hold party committee positions will be given Camry 2.0 or 2.5 models.